Eleven years since their last album, Colne's Milltown Brothers deliver their 4th, and finest, record to date. It's twenty seven years since they formed. 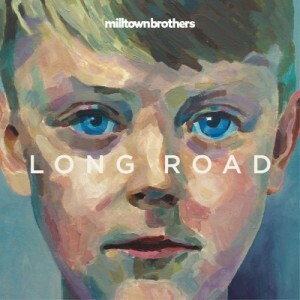 Most bands of that age roll out their hits and are content with that but not Milltown Brothers, who with Long Road have produced their most cohesive record to date. It is packed full of pop gems demonstrating that the band - brothers Matt and Simon Nelson, James Fraser, Barney Williams and Nian Brindle - have lost none of their abilities as performers or song writers. The title track, Long Road, is an uplifting country tinged number and a great reintroduction to the band, showcasing vocalist Matt Nelson's warm, soulful voice. Barney's organ on Part of Me sounds like the Milltown Brothers of old - a classic slice of pop in the same vein as Apple Green - before Bad Un slows the pace down. Rockville is a timeless piece of pop and I'm left wondering why Milltown Brothers are not household names. In the style of much lauded bands like REM and The La's, they are classic song writers. Portrait again beautifully demonstrates this point. Don't Go Crying is a melancholic, reflective number awash with Simon's slide guitar before the pace is lifted with the upbeat pop of Hideaway. For me, Hideaway is probably the standout track of the album, although there are numerous highlights. Boy Kisses The Girl is the track most reminiscent of Slinky-era Milltown Brothers, their hundred thousand selling debut album from 1991. The reflective yet hopeful Alive brings this, their best album to a close. Back in the day Milltown Brothers were always a great live draw. I first saw them opening for The La's in the spring of 1991 and only a few weeks later they were playing their own sellout shows to follow up that tour across the country. Long Road is a beautiful record and let's hope it is showcased extensively in the live arena. It deserves to be heard. Long Road is available digitally. Milltown Brothers' official website can be found here. They are also on Facebook and Twitter.